I’m speaking at this event on 20 April 2015. Its a breakfast seminar event called “Mobile Opportunities“. 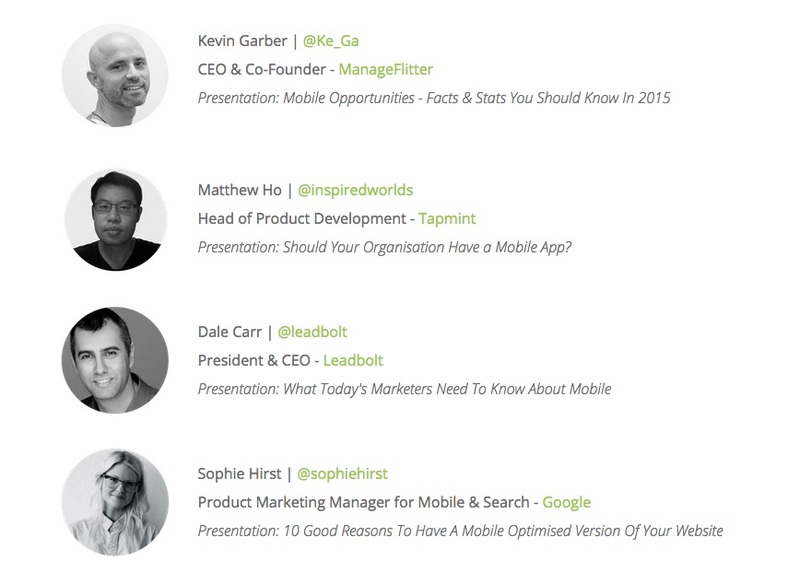 I’ll be speaking on “Should Your Organisation Have A Mobile App?”. You can RSVP here. There’s other talks on mobile as well on mobile opportunities, google’s mobile web friendly update and mobile opportunities. Here’s the list of speakers & topics in the image below. You can see more details about the event here. I’m really keen to hear the talk from Sophie Hirst (Google) on the mobile web update. This is because of the update on google mobile search results page for mobile friendly websites. Read this awesome in depth article from Moz. The cost of the event is $15. All proceeds go to the 2037 Glebe Youth Service. RSVP here. Thanks to Melon Media for organising the event. If you are interested in attending other events I’m speaking at or attending, please go to my event schedule.